The Java offsetByCodePoints method is one of the Java String Method which is used to return the index within the string that is offset from the specified index by CodePointOffset code points. In this article we will show you, How to use String offsetByCodePoints in Java Programming language with example. The basic syntax of the String.offsetByCodePoints in Java Programming language is as shown below. index: Please specify the index to be offset. codePointOffset: Please specify the offset in code points. 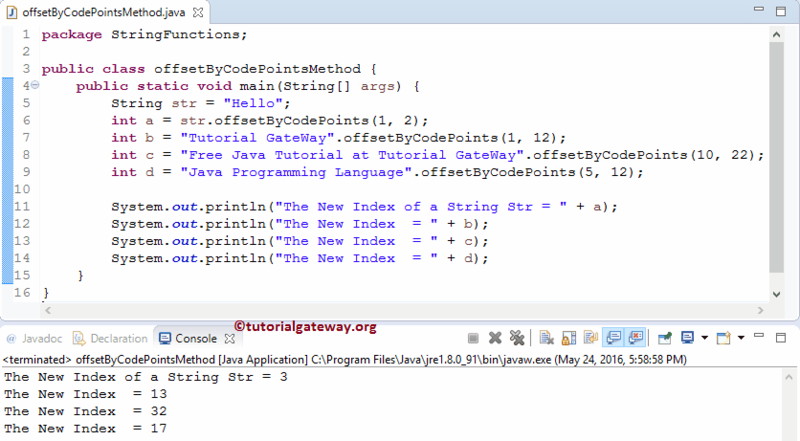 The Java string offsetByCodepoints method is used to return the index within the string that is offset from the specified index by CodePointOffset code points. In this Java program, We are going to find the same. Following statements will call the public int offsetByCodePoints(int index, int codePointOffset) method to find the index within the above specified string. Next, we are applying the offsetByCodepoints method directly on the string and then assign new index values of those strings to the integer variables b, c and d.